BackgroundSeizures are common in children admitted with severe falciparum malaria and are associated with neuro-cognitive impairments. Prolonged febrile seizures are associated with hippocampal damage and impaired memory. It was hypothesized that severe malaria causes impaired everyday memory which may be associated with hippocampal damage.MethodsAn everyday memory battery was administered on 152 children with cerebral malaria (CM) (mean age, 7 y 4 months [SD 13 months]; 77 males) 156 children (mean age, 7 y 4 months [SD, 14 months]; 72 males) with malaria plus complex seizures (MS) and 179 children (mean age, 7 y 6 months [SD, 13 months]; 93 males) unexposed to either condition.ResultsCM was associated with poorer everyday memory [95% CI, -2.46 to -0.36, p = 0.004] but not MS [95% CI, -0.91 to 1.16, p = 1.00] compared to unexposed children. 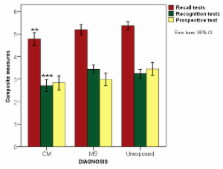 Children with exposure to CM performed more poorly in recall [95% CI, -0.79 to -0.04, p = 0.024] and recognition subtests [95% CI, -0.90 to -0.17, p = 0.001] but not in prospective memory tests compared to controls. The health factors that predicted impaired everyday memory outcome in children with exposure to CM was profound coma [95% CI, 0.02 to 0.88, p = 0.037] and multiple episodes of hypoglycaemia [95% CI, 0.05 to 0.78, p = 0.020], but not seizures.DiscussionThe findings show that exposure to CM was associated with a specific impairment of everyday memory. Seizures commonly observed in severe malaria may not have a causal relationship with poor outcome, but rather be associated with profound coma and repeated metabolic insults (multi-hypoglycaemia) that are strongly associated with impaired everyday memory. Interest in mapping the global distribution of malaria is motivated by a need to define populations at risk for appropriate resource allocation and to provide a robust framework for evaluating its global economic impact. Comparison of older and more recent malaria maps shows how the disease has been geographically restricted, but it remains entrenched in poor areas of the world with climates suitable for transmission. Here we provide an empirical approach to estimating the number of clinical events caused by Plasmodium falciparum worldwide, by using a combination of epidemiological, geographical and demographic data. We estimate that there were 515 (range 300-660) million episodes of clinical P. falciparum malaria in 2002. These global estimates are up to 50% higher than those reported by the World Health Organization (WHO) and 200% higher for areas outside Africa, reflecting the WHO's reliance upon passive national reporting for these countries. Without an informed understanding of the cartography of malaria risk, the global extent of clinical disease caused by P. falciparum will continue to be underestimated. Summary Many children younger than 5 years in developing countries are exposed to multiple risks, including poverty, malnutrition, poor health, and unstimulating home environments, which detrimentally affect their cognitive, motor, and social-emotional development. There are few national statistics on the development of young children in developing countries. We therefore identified two factors with available worldwide data—the prevalence of early childhood stunting and the number of people living in absolute poverty—to use as indicators of poor development. We show that both indicators are closely associated with poor cognitive and educational performance in children and use them to estimate that over 200 million children under 5 years are not fulfilling their developmental potential. Most of these children live in south Asia and sub-Saharan Africa. These disadvantaged children are likely to do poorly in school and subsequently have low incomes, high fertility, and provide poor care for their children, thus contributing to the intergenerational transmission of poverty. Severe falciparum malaria. World Health Organization, Communicable Diseases Cluster. Copyright statement: Copyright ©2009 Kihara et al; licensee BioMed Central Ltd.
Corticosterone protects against memory impairments and reduced hippocampal BDNF levels induced by a chronic low dose of ethanol in C57BL/6J mice.